Burn injury is a three-dimensional wound that causes massive tissue loss in the victim. Treatment of burn wounds involves a unique combination of modalities. In addition to topical wound care needs, the patient is at risk for numerous systemic complications associated with the absence of large amounts of epidermis and/or dermis. The goal is not only to save the patient’s life but also to restore the structure and function of the body so as to prevent or minimize disfigurement and disablement. In comparison, currently for deep partial thickness burns (extending into the reticular layer of the dermis) and full-thickness burns (extending through the dermis and into subcutaneous tissue), unless very small in size, the standard treatment modality is to use skin grafts to close the wounds. Prior to the skin grafting, the wound bed is usually prepared by treating with daily or twice-daily dressing changes with topical antimicrobial application to control the growth of microorganisms and prepare the wound for grafting. Honari (2004) Crit. Care Nurs. Clin. North. Am. 16:1. Bryant & Nix (2007) Acute & Chronic Wounds: Current Management Concepts, Chapter 18 by Jill Evans, 3rd Ed., Mosby, Inc. Successful skin grafting could repair the wound through revascularization with sprouting and budding of vessels in both donor and recipient sites. Falabella & Kirsner (2005) Wound Healing, Chapter 41 “Skin Grafting: Surgical Techniques” by Yamaguchi et al., Taylor & Francis Group, Boca Raton, FL. However, in the grafted epidermis and dermis, the function of the appendages of the skin such as hair follicles, nerves, sweat glands, and sebaceous glands is severely compromised, if not completely lost. Thus, although the patient’s life is saved and wound closed, a significant loss of physiological functions of the skin results and, for patients with large area burns, decrease in morbidity is inevitable. Dr. Xu’s invention of the system of MEBT/MEBO brought a revolution to this field. 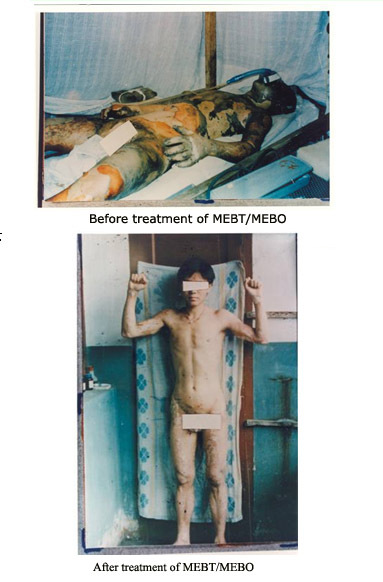 Preclinical experiments on animal models and clinical application to the treatment of millions of patients in China and other countries demonstrate that under the regenerative conditions provided by using the MEBO technology (moist exposed burns therapy (MEBT) and the MEBO products (e.g., MEBO wound ointment and MEBO wound dressing), regeneration of full-thickness skin with restoration of physiological structure and function can be achieved. 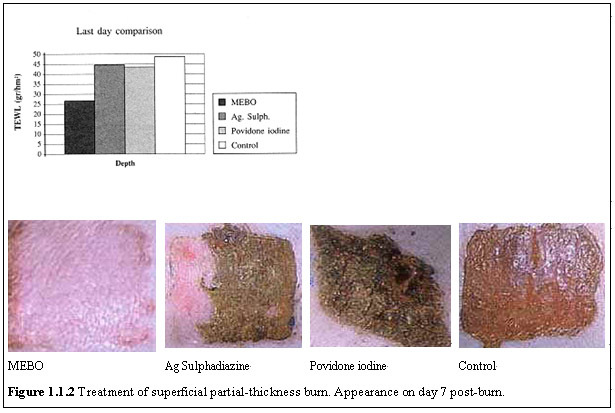 To evaluate the efficacy of MEBO wound ointment on tissue repair and regeneration, preclinical studies were carried out in pig models for burn wounds as compared with that of local wound care agents commonly used in wound treatment. Ioannovich et al. “Moist Exposed Burn Therapy: Evaluation of the Epithelial Repair Process (an Experimental Model)” Annal of Burns and Fire Disasters 2000: XIII (J):3-9. Eighty (80) partial-thickness burn wounds on 10 Ladrace-Pietrenne young pigs were induce by CO2 laser. 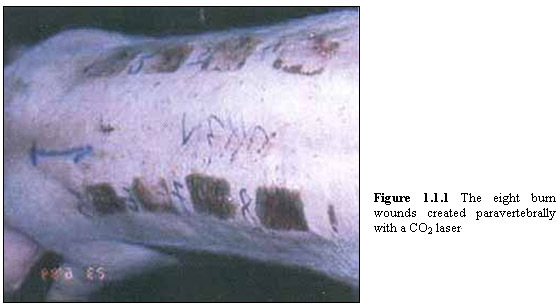 As shown in Figure 1.1.1 below 8 partial-thickness burn wounds of different depths measuring 5 x 5 cm were inflicted on either side of the paravertebral region in each pig (total number of burn wounds: 80). During the past twenty years, several controlled clinical trials have been conducted, and thousands of clinical observations and reports have been published on application of MEBT/MEBO to the treatment of wound patients. MEBO has been shown to maintain burn wounds in moist, reduce water evaporation from burn wounds, promote microcirculation in wounds, limit progressive damage after burn, facilitate liquefication and discharge of the necrotic tissues, reduce secondary injuries caused by aggressive surgical excision, prevent wounds from infection, and, furthermore, introduce regeneration of skin tissue over the viable tissue on wounds. The results from extensive controlled clinical studies, along with clinical observations in thousands of burn and chronic wound patients, have demonstrated that MEBO reduces both the physical and psychological pains during treatment, accelerates wound healing process, minimizes scarring, reduces medical costs, and provides better quality of life for wound patients. During the treatment, MEBO wound ointment is applied to the surface of the wound at 0.5-1 mm in thickness. The wound area is left exposed and the wound bed is kept in moist by the ointment, in contrast to conventional practice that the wound is occluded by dressing or exposed to dry out. This is referred to as Moist Exposed Burn Therapy (MEBT). Every six to twelve hours the wound is cleaned, and liquefied necrotic tissue with MEBO ointment is wiped off followed by reapplication of MEBO ointment. This regimen is repeated until the wound is healed. To study the physiological healing process, histological examination was performed on tissue samples taken from deep second-degree burn patients under the treatment using MEBT/MEBO. Xu “Physiological Healing Procedure and Histological Observation on Deep Second-Degree Burns Treated with MEBO” Burns Regenerative Medicine and Therapy, 1st ed., Basel: Karger; 2004. p.106-111. Six cases were enrolled throughout the study, 5 males and 1 female, aged from 21 to 36 years-old. Total burns surface area varied from 12% to 45%, with an average of 24.33±12.37%. All patients were admitted within 6 h post-burn. After admission, patients received fluid resuscitation and antibacterial therapy on the basis of burn severity. Burns wounds were applied with MEBO at a thickness of 1 mm, which was repeated every 4-6 h till wound was healed. 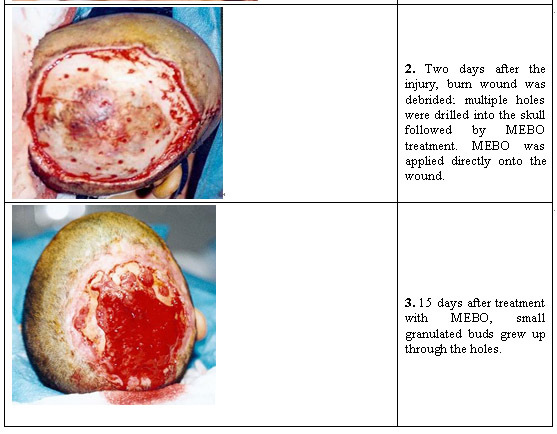 As shown in Figure 1.2.1.1, the tissue at the wound site underwent dramatic patho-morphological changes during the treatment using MEBT/MEBO. 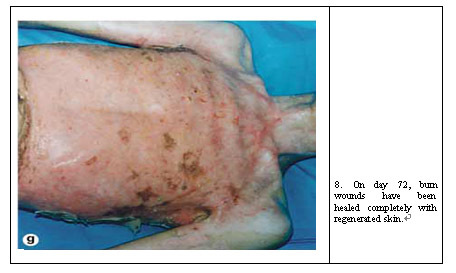 Under the conditions provided by MEBO wound ointment, pathological changes of the deep second-degree burn wounds can be divided into three stages: (1) denaturation and necrosis of injured tissue, (2) liquefaction and discharge of the denatured and necrotic tissues, and (3) restoration of physiological structure and function of the skin. These stages may overlap. As shown in Figure 1.2.1h, the newly regenerated skin has virtually an identical morphology and structure to that of non-injured skin. No skin grafting was performed. 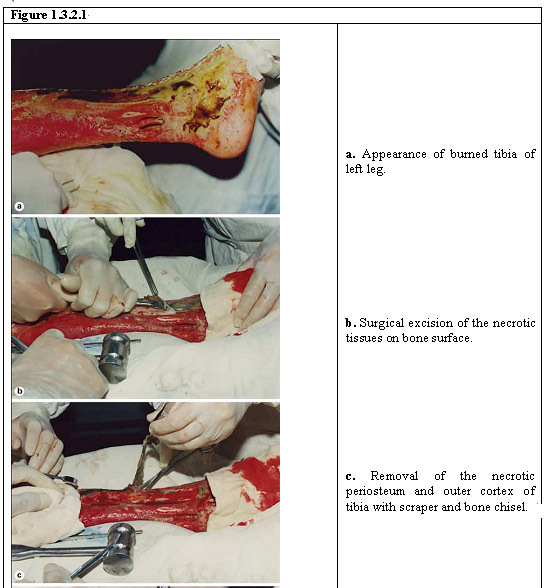 As described in detail by Xu in “Clinical Procedure and Histological Observation of Full-Thickness Burns Treated with MEBO” in Burns Regenerative Medicine and Therapy, 1st ed., Basel: Karger; 2004. p. 111-114, MEBT/MEBO was used to treat a patient with extensive full-thickness burns in her lower extremities. 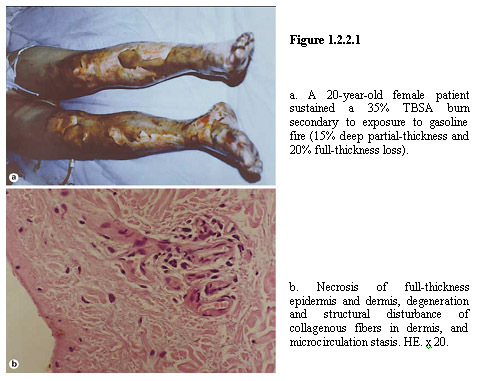 A 20-year-old female patient was hospitalized at 12 h after a gasoline fire burn and was diagnosed with 35% TBSA burn (15% deep partial-thickness and 20% full-thickness burns on both lower extremities). The epidermis was necrotic and detached and the dermal layer was degenerated and necrotic with a waxy yellow and waxy white appearance (Figure 1.2.2.1a). 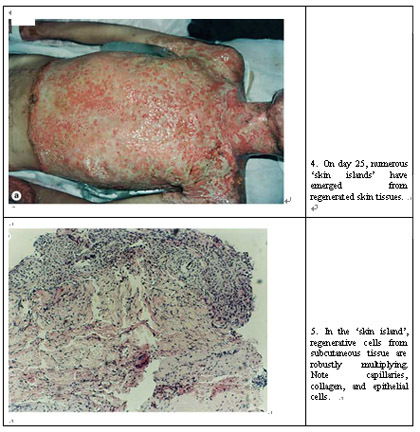 The pathological section examination of the sampled local wound tissues revealed a necrosis in full-thickness of epidermis and dermis, degeneration and structural disturbance of collagenous fibers in dermis, and microcirculation stasis (Figure 1.2.2.1b). After admission, the patient was treated with MEBT/MEBO wound ointment to protect burn tissue. At 48 h postburn, the wounds began to liquefy and the liquefaction was complete by day 4 (Figure 1.2.2.2). The liquefied products were gently removed from the wound surface before MEBO ointment was reapplied every 3-4 h. Repeat biopsy at the same burned location was performed for pathological examination. 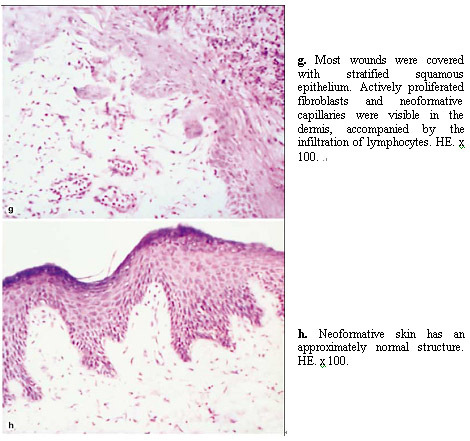 The results showed massive granulation tissues among the necrotic epithelial tissue, a proliferation of newly regenerated epithelial cells with collagenous fibers, as well as the typical skin embryonic base (EB) (Figure 1.2.2.3a, b). After a 10-day application of MEBO ointment, embryonic-like epithelial tissues were observed in epithelial tissues sampled from the wound edge. At 20 days post-treatment with MEBO, the pathological examination of deep burns wounds tissue showed the presence of the newly formed intact stratified squamous epithelium. The epithelial cells of the superficial layer appeared normal. Appearance of the collencytes and microangium in the dermis layer was typical. On day 30 post-treatment, epithelial tissues showed a remarkable degree of regeneration (Figure 1.2.2.4a), and skin structure was virtually normal (Figure 1.2.2.4b). Twenty days post treatment with MEBO, immunohistochemical examination of the wound tissue was performed and the results showed the clear appearance of collagenous fibers in epithelial tissue and subcutaneous tissue (Figure 1.2.2.5). Twenty (20) days post-treatment, appearance of the hemidesmosome junction between the basal cell layer and epithelia was observed. Active mitochondria and RER in fibroblasts also appeared (Figures 1.2.2.8a-c). Thirty (30) days post-treatment with MEBO ointment, with the regeneration and repairing of epithelium almost complete, collagenous fibers were mature with a diameter of 0.1-0.5 µm and arranged in an orderly fashion (Figure 1.2.2.9). Light and dark periodic cross-striation (64 nm) was also observed. No pathomorphological changes of collagenous fibers such as distortion, helicoid (whirlpool) or cauliflower-like form were observed. After wound healing, functional exercises and physiotherapy of the lower extremities were performed. MEBO wound ointment was used continuously as regular skin oil. The patient healed and was discharged home on day 45 postburn. Deep 2nd and 3rd degree burns on the hand assume a high priority from the onset of care in order to preserve its sensory and mobile functions. 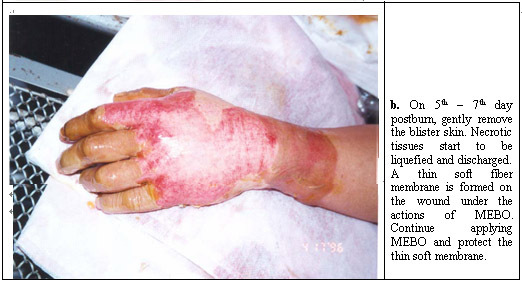 As shown in Figure 1.0.2 severe burn injury of the hand can lead to severe joint contracture and loss of hand function. Normally, early excision and sheet autograft closure are recommended. Hand therapy is continued throughout the healing period, halted only in the few days immediately after grafting. Sometimes only suboptimal function can be obtained in a long term. MEBT/MEBO has been used to successfully treat deep, severe hand burns without skin grafting and with satisfactory restoration of form and function to the injured hand. Shown in Figure 1.2.3.1 is an example of using MEBT/MEBO to treat deep 2nd degree burn of a hand of a patient. The face constitutes 5-10% of the body’s surface area, varying according to age. Face burns cause a considerable loss of fluids owing to the elasticity of the tissues affected and the abundance of vascular tissue. In deep partial-thickness burns, spontaneous recovery occurs with the formation of a considerable quantity of unaesthetic scarring. Third-degree burns (full-thickness burns) destroy both the epidermis and the entire dermis and are insensate because of the loss of sensory nerve endings. A full-thickness burn is dry and leathery with a gray, white, or translucent color; it turns brown or black in color, characteristic of an eschar. Most of these wounds do not heal spontaneously unless they are very small, skin grafting is often needed for closing the wounds, and the resulting scars may be quite disfiguring, which necessitates post-healing reconstructive surgery on the scars. MEBT/MEBO has been used in thousands of cases to successfully treat deep facial burns with minimum scarring and disfigurement, thereby obviating the need for post-healing reconstructive surgery. Shown in Figure 1.2.4.1 is an example of using MEBT/MEBO to treat a patient with full-thickness burns on his face and neck. 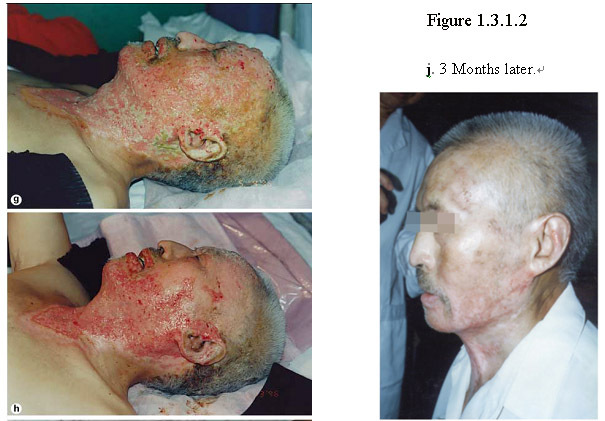 Shown in Figure 1.2.4.2 is another example of treatment of deep facial burn wounds using MEBT/MEBO. This patient’s face was burned by electric arc, resulting in superficial 2nd degree and superficial 3rd degree burns. As shown below, on day 109 since the treatment with MEBT/MEBO, the skin on his face was regenerated with no apparent scarring and loss of function. Extremely large (>40% TBSA) and deep (>2nd degree) burn wounds pose a major medical challenge due to massive loss of tissue and potential systemic complications. To save life and heal the wounds, aggressive surgical approaches with early tangential excision and wound closure are usually taken. Autografts from uninjured skin of the patient are taken to be used to cover the burn wounds, the wounds as a result of which further increase the TBSA affected. When the patient’s skin donor sites are limited or the overall patient condition do not permit immediate grafting with autologous skin, human cadaver allograft skin (HCAS) and xenografts are used as temporary burn wound cover. Serious problems, however, are associated with HCSA and xenografts, including limited supply, variable and occasionally poor quality, inconvenience of harvesting skin in the mortuary, and ultimate immune rejection. Cultured epithelial autografts have been developed for the treatment of extensively deep burns. A major disadvantage of this approach is the delay in providing cultured keratinocyte sheets for practical clinical use, in addition to fragility and difficult handling of the grafts, an unpredictable “take” and extremely high costs. Widespread use of cultured autografts has been primarily hampered by poor long-term clinical results. Even if the patient’s life is saved, severe disfigurement and disablement often result. Against this grim background, the innovative approach taken by Dr. Xu represents a major paradigm shift. 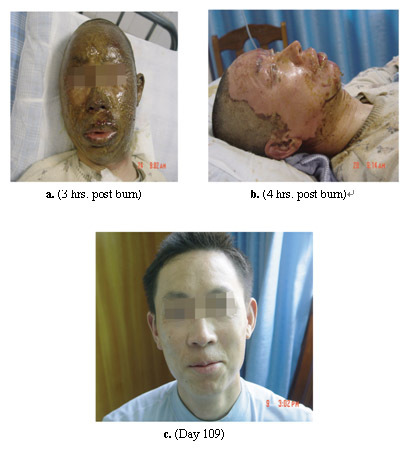 By using MEBT/MEBO, Dr. Xu and now a network of clinicians throughout China have successfully treated tens of thousands of patients with deep, extensive burn wounds. The patients not only survived, but also thrived with minimum disfigurement and disablement. Shown below are a few examples of patients treated with MEBT/MEBO. Case 1: Male, age 18, burned by gas flames, 95% TBSA (superficial 2nd degree burn 30%, deep 2nd degree burn 59%, 3rd degree burn 6%), treated with MEBT/MEBO for 55 days. Case 2: Male, age 21, scalded by hot water, 98% TBSA (superficial 2nd degree burn 40%, deep 2nd degree burn 58%), treated with MEBT/MEBO for 30 days. Case 3: Female, age 20, burned by gas flames, 91% TBSA (superficial 2nd degree burn 10%, deep 2nd degree burn 76%, 3rd degree burn 5%), treated with MEBT/MEBO for 52 days. 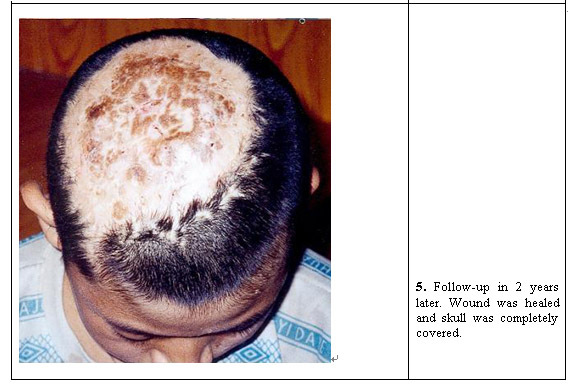 Case 4: Male, age 20, burned by nitre flames, 90% TBSA (superficial 2nd degree burn 20%, deep 2nd degree burn 30%, superficial 3rd degree burn 30%, deep 3rd degree burn 10%), treated with MEBT/MEBO for 43 days. Case 5: Male, age 31, burned by nitre flames, 90% TBSA (deep 2nd degree burn 60%, superficial 3rd degree burn 20%, deep 3rd degree burn 10%), treated with MEBT/MEBO for 31 days. MEBT/MEBO has also been used to successful regenerate the skin and underlying soft tissue of the ear after burn injury. The exposed and projecting auricular conchas are easy to be injured. The skin and subcutaneous tissue of external ear are thin, so ear burn always compromises auricular cartilage. Besides, since it was near hair and was connected with external auditory canals, and ears themselves were too irregular and rough to be cleaned, ear burn was usually complicated with infections and suppurative perichondritis of auricle post injury. Shown in Figure 1.3.1.1 is a case where the patient was burned in face and neck by boiling oil. As shown below, on day 88 since the burn injury the structure and function of his ear was substantially restored with no compromise of hearing. Shown in Figure 1.3.1.2 is the same case shown in Figure 1.2.4.1 where the patient’s ear also sustained deep burn injury and treated with MEBT/MEBO. As shown below, on day 30 post burn injury his wounds on his face, neck substantially healed. A follow up examination 3 months later revealed that the structure and function of his ear was substantially restored with no compromise of hearing (Figure 1.3.1.2j). When the burn destroys the skin and underlying tissue to reach the bone, the injury can result in compartment syndrome and threaten the patient’s life or limb. Dr. Xu led a pioneering work in the regeneration of tissues beyond the skin by utilizing bone marrow cells exuding from holes drilled on the bone. As shown in Figure 1.3.2.1, the patient’s left leg had burn wounds with tibia exposed and was treated with MEBT/MEBO. Multiple holes were drilled in the exposed tibia and covered with gauzed soaked with MEBO wound ointment. Granulation tissue developed from the bone marrow cells migrated from the cavities created and under the regenerative condition provided by MEBT/MEBO the bone marrow cells were converted to multiple different cell types needed for regeneration of muscle, tendon, ligament and other soft tissue. 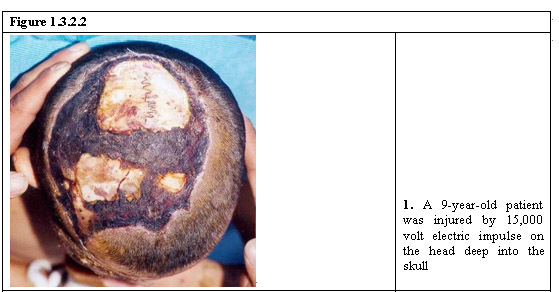 Shown in Figure 1.3.2.2 is another case where a 9 year-old patient’s head was injured by high-voltage electric burn and the injury reached deep into the skull. He was treated with MEBT/MEBO. Multiple holes were drilled on the skull to allow cultivation and conversion of bone marrow cells in order to regeneration soft tissue and the skin on his head. 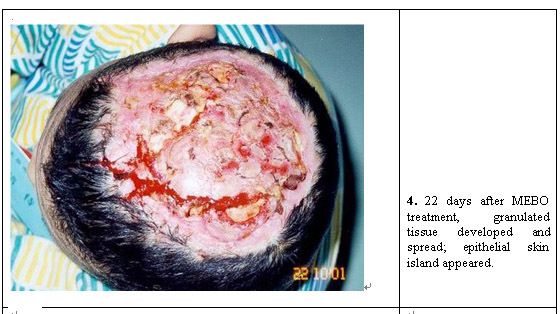 As shown below, 2 years after the injury his skull was completely covered with regenerated tissue and skin.